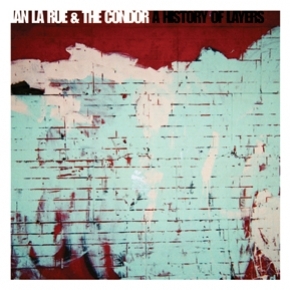 “A History of Layers” is the fourth release from beloved Winnipeg singer/songwriter/artist/activist Ian La Rue, and the first with new band The Condor. Featuring Matt Magura on drums, Andrew Workman on guitar and producer Mike Petkau on bass (a spot now filled by new member Louis Lévesque Côté), The Condor provide a variety of new colours to La Rue's already dazzling palette. Among the healthy, ever-growing crop of thoughtful songwriters that have emerged from the oddly fertile city of Winnipeg, Manitoba, La Rue has remained ever distinguished by his overarching passion, his remarkable positivity and his electrifying performances, as well as his willingness to step outside of his comfort zone and tackle a variety of projects. Playing and touring both solo and as a member of other bands since 1998, creating scores for film and performances, foraying into visual art, and organizing events and actions have contributed to his skills as a songwriter, a performer and a keen-eyed observer of the human condition. La Rue is well known alternately for his stunningly intense, affecting live performances (both solo and with the Condor) and the more layered, atmospheric power of his recordings. On “A History of Layers,” Ian connects the two sides of his music as never before, presenting the raw, confident power and live energy of his new band without losing the attention to detail and experimentation that he's known for. Recorded over a year and a half period at MCM studios in their hometown, the group has created a document that sacrifices neither clarity nor passion; the scrappiness of a raging live performance and the precision of a studio stream seamlessly and simultaneously. Lyrically, La Rue explores the undercurrents of fear and despair that mark modern urban life, but always with an eye on solutions and an abiding faith in our power to overcome. The title of the album alludes to not only the layers of complexity and contradiction that we must attempt to unravel in search of these solutions, but also to building community, and working together towards a common goal. This album is not just an exploration of these goals but a culmination of them, as La Rue, The Condor, and his vast constituency of friends and musicians can easily attest. "A History of Layers" will be available February 12, 2010 with national touring to follow.